It's the most wonderful time of the year and I have been crafting away, enjoying the fireplace, the decorations, all the festivities that the season has to offer. 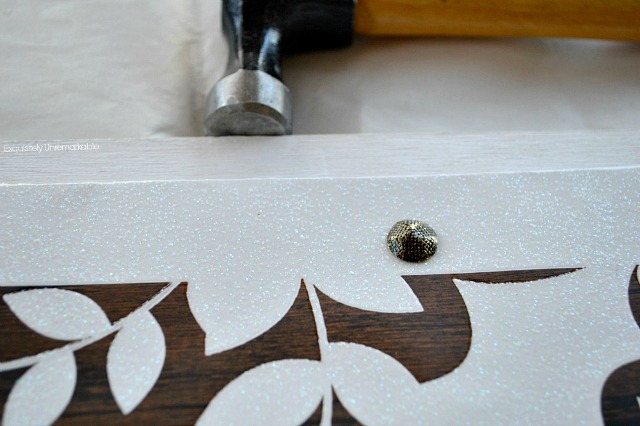 Today, for example, I am sharing another DIY to help you cheat your way to an elegant looking wooden sign. This one is also made from a Christmas gift bag. I know, I know. I'm obsessed. It's just that the bags are so sweet, very inexpensive and there are so many ways to transform them, I haven't been able to stop. There are bags to fit any taste, style and occasion. Last week, I showed you a dainty wooden sign that I made with a dollar store bag for my bedroom. The sign I made today is constructed a little bit differently. The look is different too, it's more rustic and a lot heavier. It's not hanging over my head, so I didn't have to worry about its weight this time around! Awesome. I happened upon this very unique bag while I was Christmas shopping. It looks like a wood carving, complete with grained paper and raised leaves and I knew immediately it would be perfect as a sign. I went straight to the hardware store and bought a board for about five bucks. They even cut it to size for me...16 inches square. 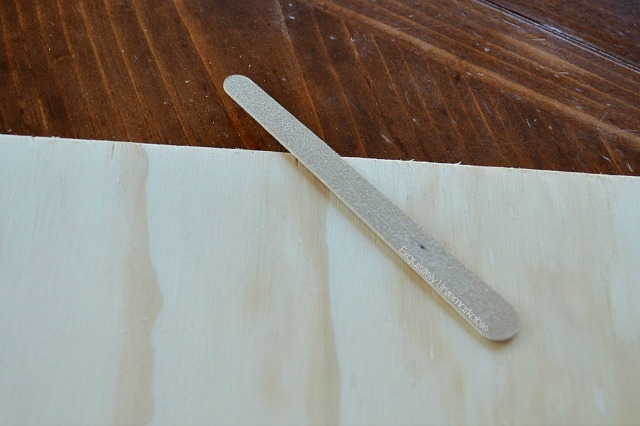 I am all about super easy crafts and I don't own any power tools, so I love the fact that I can get a board cut for free, right when I need it, without bothering (or waiting for) my husband. I'm also a lazy crafter. Rather than going out to the garage to search for the proper weight sandpaper, I grabbed a cheap emery board from my nail bin and filed off any rough edges. When I was sure that my edges were smooth, I painted a thick border on the top and the sides with white craft paint and a foam brush. I did not prime the wood or seal the paint. I just squired the paint directly onto the wood and smoothed it out with the brush. I like a rustic finish and, well, I'm lazy, remember? While the paint was drying, I cut the bag. I made sure to leave a wide lip all the way around so that I would have a nice finished edge when I attached it to the board. This bag was $3.00 as you can see. It was not a dollar store special, but that's fine with me, it is really outstanding. Since this sign was going in my living room, it needed a little bit of weight to coordinate with the stone fireplace and beamed ceiling. So instead of simply gluing the bag to the wood, I used upholstery tacks to secure it. The tacks also covered up the holes that were left in the bag when I removed the handles. Pretty and functional. A simple tap of the hammer was all it took ~ and yes, I do own my own hammer. In order to make sure that my tacks were evenly spaces all around the bag, I took the other half of the bag and used the holes left from the handles as a guide. It worked like a charm. I eyeballed the four I added to the corners. That's it, that's all it took to create an elegant focal point for my rustic Christmas living room...paint, cut and tack. Done. I think that this is one of my all time favorite holiday crafts. 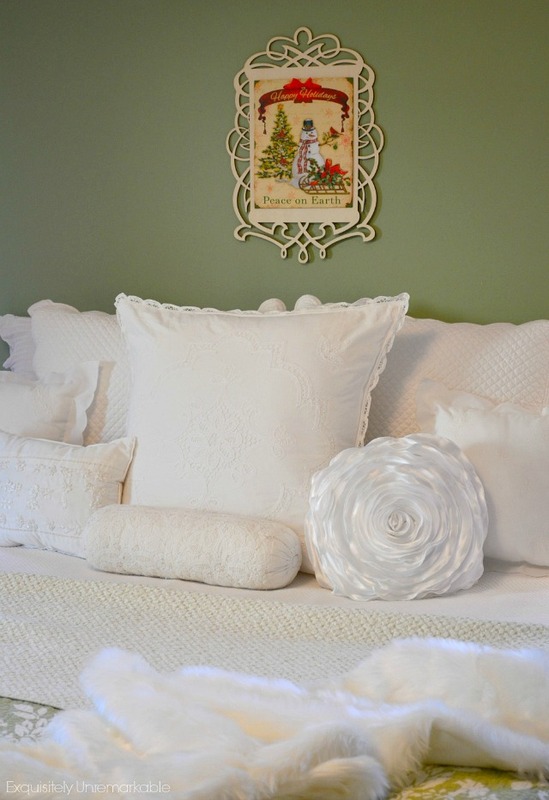 It looks great in the day and at night by the twinkle of the Christmas tree. ...easy, inexpensive, elegant and Exquisitely Unremarkable. 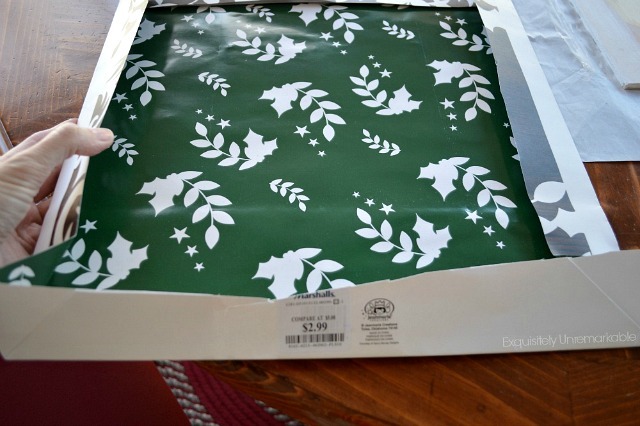 What do you do with your old holiday gift bags? Hey before you go, don't forget to check out my SHOP TAB for supplies I use in my crafty DIYs and for so pretties I just can't resist. And be sure to sign up for my emails so you never miss a crafty tip, trick or giveaway! 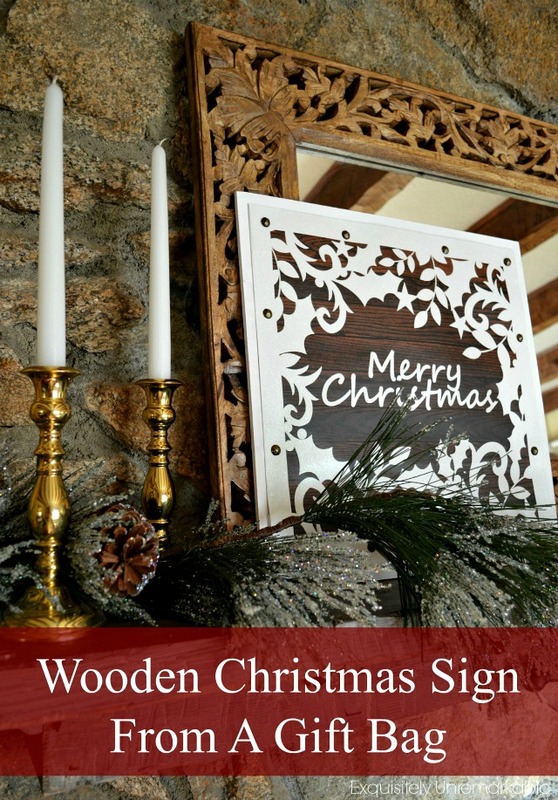 Here's another easy sign for Christmas. 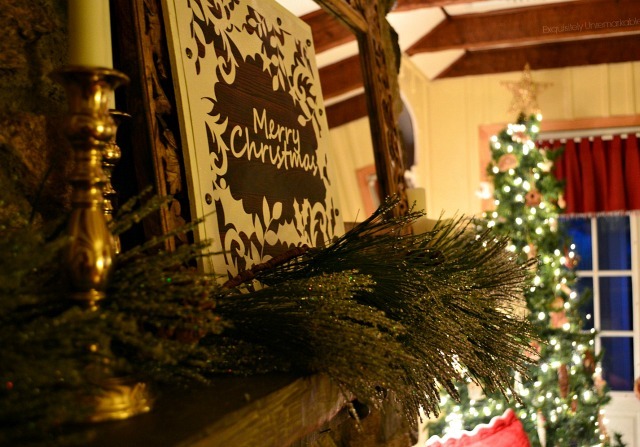 And some more rustic Christmas inspiration. Love all the inspiration and love your gift bag signs. Too clever and cute. Have a great start to the new week Kim. That is beautiful! I hope I find some bags this pretty to try this - pinned it! I am kind of addicted to these gift bag crafts now, CeletinaMarie! I have one more that I want to share. I can’t help myself! ;) And thanks for your kind words! So sweet Kim, love how you added that tacks! It looks awesome on your fireplace. Wow, Kim you would never know that used to be a bag, this is amazing and so creative! Love it! Thanks! Some of the bags are really outstanding, Kimberley. Once I started looking I was really amazed. That looks like a beautiful carving, Kim! Great job but I'm not surprised...you see the possibilities in the simplest things. 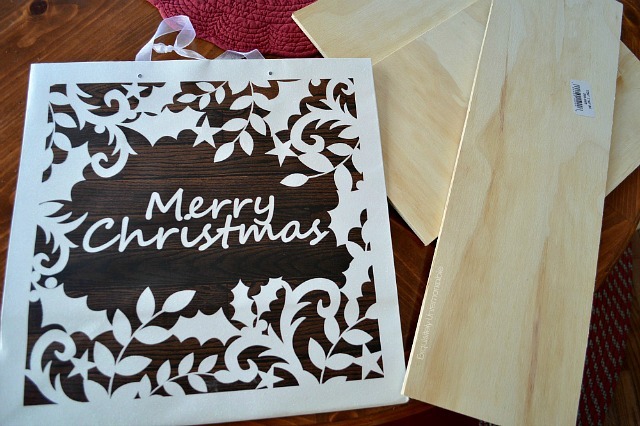 Wow, what you did with this is amazing, I love the white on wood and it looks so pretty! Lisa, I think you have created a gift bag monster! ;) Glad you’re enjoying the inspiration. There are a lot of creative ladies out there! What a great DIY project. Love the sign! Thanks so much. I had fun with this bag! 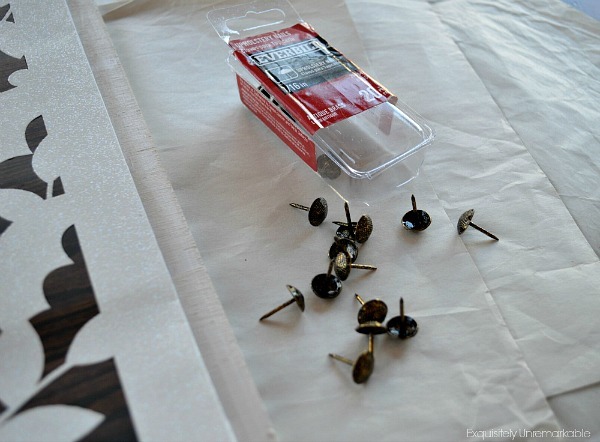 A great project and love it also like how you aded the tacks...you are very creative! I have seen so many beautiful bags, some that even look like chalkboard signs, and what a great idea to use them that way! What a quick and easy craft for your mantel Kim. I have to commend you on your use of sophisticated non-power tools and the use of the nail file!! And I thought I was bad ! Have the happiest of Holidays! I just grabbed a bag at the Dollar Store the other day for that same purpose!!! 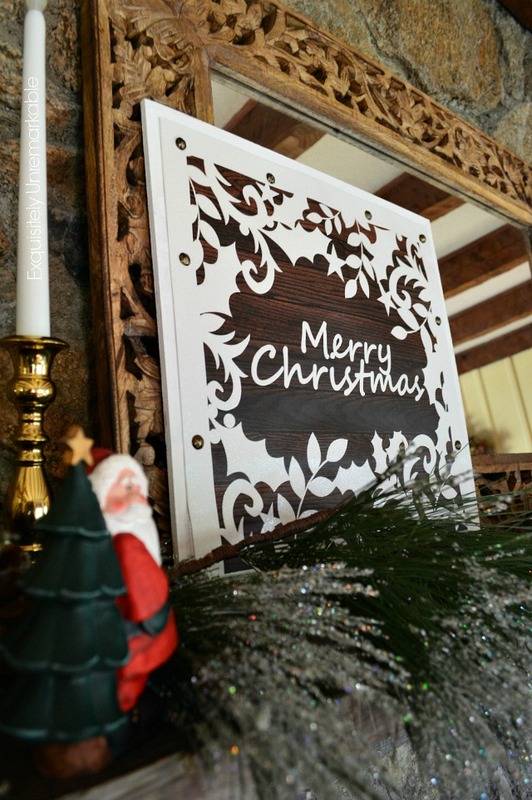 Love your Merry Christmas sign though, just looks so pretty and high-end too! Hello Kim, those gift bag signs are magnificent! even though I save my used gift bags I would have never thought to reuse them in this way. Thanks for sharing and inspiring. Have a great week! Thanks Karen! 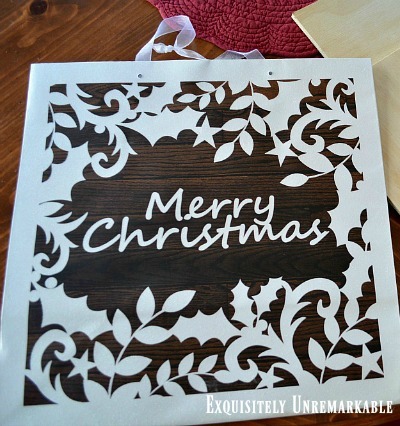 I am all about easy crafts and this one fits the bill. I think I might have a bag problem now though! ; ) Thanks for the visit!! What a great idea and love how easy it is to make. You are the queen of signs. LOL, lovely Christmas decor friend. I love this! What store did you buy the bag at? Hi Jenny! I found this bag at Marshall’s. I just bought it. I bet they have it at Home Goods and TJMaxx, too! Ok, I am so amazed by how clever this is, I've got to go back & read it again! lol What a great idea! Well that sounds like an amazing idea, too, Marie!! Thanks for the inspiration....hmmm. you are such a talent . . . inspiring . . .
and it is encouraging for others too . . .
happy december creating days kim . . .
What a fun and creative idea, and it looks so pretty. You are amazing and have a way of making things looks easy! This is a great and beautiful project! You never cease to amaze me!!! 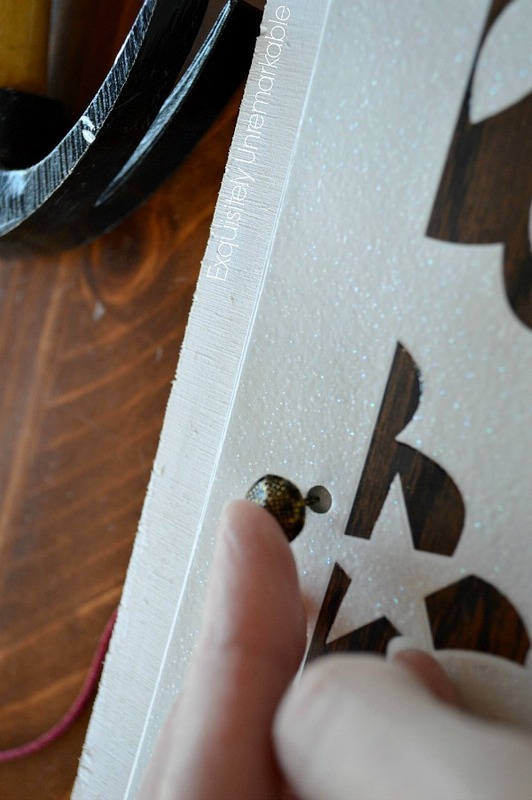 This is a super easy and absolutely lovely project - even I could accomplish this one!! Love, love, LOVE!! This is just beautiful! I don't think I've ever seen a gift bag that pretty, and I cracked up at your emery board sander. That's totally something I would do! I think my husband ~ a super handy, by the book kind of guy ~ cringed when he read that! I'm glad someone gets it! ;) And thanks, Meredith!! What a great idea. I would have never guessed it was a bag. Well done! Merry Christmas! Thanks so much, Tami! It was super easy and now I am kind of addicted to these bags. ;) Merry Christmas! Thank you so much and I am sure you have something in that bag stash!! :) Have fun!! Wow Kim, you made another nice Christmas picture! I will have to try your idea!! Love it. I hope you have a nice day and week! I'm so glad you keep sharing all of these wonderful projects! While I cannot do some of them, I do like dreaming about the possibilities one day! Love this...so pretty!! Looks beautiful on the mantel! Hugs! You could totally do this one, Benita!! Easy! I promise. That turned out really really cute! It actually looks like something you bought. Pretty look with this technique! Kim, funny post, love the humor!! 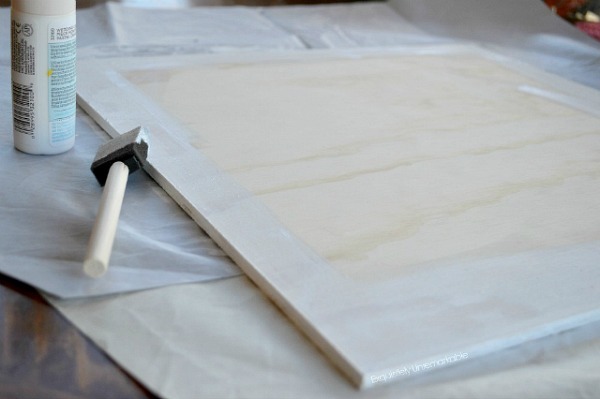 I think the emery board as sandpaper, the holes in the bag as a guide, and your use of a gift bag as wall art are all so incredibly clever!! 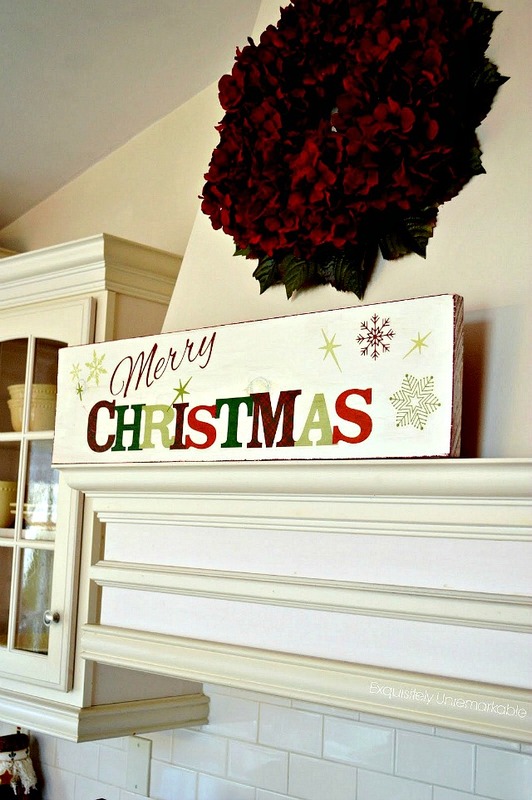 This sign is beautiful, and looks so lovely as Christmas decor!! Haha! Yes, I am definitely a cutting corners kind of gal and so glad you found it funny! ;) That's the best compliment! Really cute! 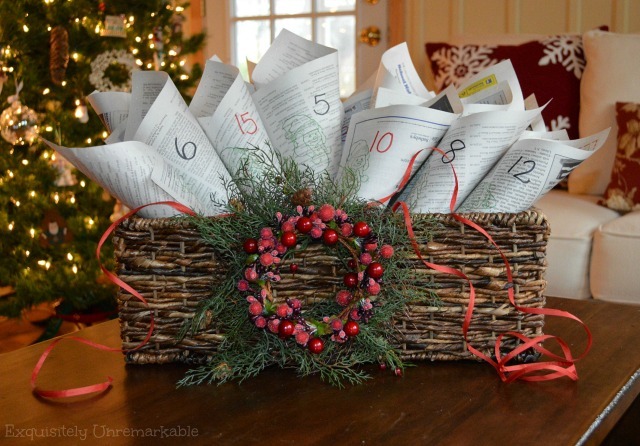 What a fun holiday project! Even though it's "only a shopping bag," it's super cute & you saw the potential Kim. It looks so sweet up there on your mantel...like an expensive piece of decor. Thanks Florence! Some of those gift bags are like artwork. Too pretty to put in a drawer! Your Christmas sign turned out lovely. It really looks like it was cut out on a scroll saw. Thanks Linda...this was a fun one and I couldn't resist that bag when I saw it!